Facebook usually dominates the paid social conversation, with Twitter as a distant second. But have you considered LinkedIn for your next digital marketing initiative? Many advertisers are turning to this professional networking site, and with a sound strategy, the right businesses can excel with it. The factors to consider when determining if LinkedIn would be a smart use of ad spend are your product and your customer base. LinkedIn is likely a good fit if you offer a product or service to businesses and know generally who the decision makers are that you’d like to reach. We see good results with B2B offerings because LinkedIn reaches professionals who are in a work mindset while looking through content in their feed. Compare this to Facebook, which usually works better for B2C products and services. Users there tend to be in more of a social mindset while browsing Facebook, thinking more of their friends than their business. LinkedIn ads are highly targeted and can reach a precise audience based on geographics, demographics, job title, employer, role, skills, groups, and more. If you have an idea of your customer persona based on these criteria, then LinkedIn ads should certainly be in your consideration set. So if you’re ready to get started you can follow LinkedIn’s account setup instructions and begin building campaigns! The first step will be creating a targeted audience and each of the various ad types. Then it comes down to testing and iterating on the ads, audiences, and settings. Let’s start with audience creation. If you only get one thing right, make it your audience targeting. The people you reach are arguably the most important factor in the success of your campaigns. You can create the perfect ad for group health insurance plans, but get no responses if it’s only shown to middle managers with no power to make a decision on that for their company. I recommend writing down all the relevant information you can think of about your target audience, and browsing through all the options LinkedIn has available until you piece together a precisely targeted group. Remember that you can both include and exclude any of these criteria from your targeting, and overlay more than one since they are treated like “and statements.” In other words, it will target the overlapping center of the Venn diagram you create with the different targeting options. As you make adjustments, you’ll see your estimated target audience size change. So what size should you be shooting for? While there’s no right or wrong answer here, and the highs and lows fluctuate based on the size of your geographic targeting, you generally want to stay above 1,000 and below 100,000, with my personal sweet spot around 10,000 to 20,000. This usually gets you a fairly focused audience with enough room to test. I have gone much smaller as well, at about 3,000 users, and still had strong results. The upside of going smaller is that the audience is very focused and exactly who you want, it just takes more attention and could potentially burn out over time. If you go much bigger, say, upwards of 50,000, you can cast a wide net and achieve some brand awareness goals while learning about different parts of the audience and filling the very top of the sales funnel. It’s not a bad idea if you have the budget for it, but your ROI will be much stronger the more targeted your audience is. The last part of audience creation to be aware of is retargeting. 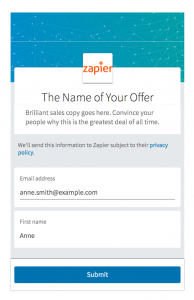 You can upload a customer list, which will be matched with current LinkedIn users if you want to reach your current or past customers with an upsell, referral, or return offer. You can also install the LinkedIn Insight Tag on your website and include or exclude everyone who’s been to your site, or visitors of specific pages on your site. One use case could be showing the viewers of specific products on your site ads for that same product again, while excluding those who made it to the checkout confirmation page. To create a marketing funnel, reach different people for different offerings you may have, or even just to test different groups, you will need to create multiple campaigns targeting different audiences. And those campaigns will need ads, so let’s look at the different ad types and when to use them. When you create a new campaign, the first decision you will have to make is which type of ad you want to use. 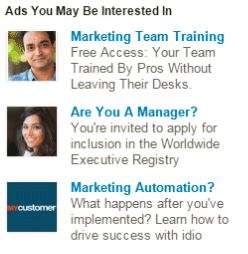 The three choices are: Sponsored Content; Text Ads; and Sponsored InMail. There are also Dynamic Ads which are not an option in the standard interface. Each have their own uses and average performance metrics. Let’s take a look at each one. Sponsored Content is the bread and butter of LinkedIn ads. These look very similar to other posts that appear in the newsfeed. You can either “boost” (to use a Facebook term) an existing post from your company page, or create an ad from scratch called Direct Sponsored Content. These are great because you can upload a large image to help you stand out in the newsfeed. They also offer plenty of room for text in the headline and the description that appears above the image. Users can interact with these ads so be sure to check for comments periodically. Your Sponsored Content ads should use an eye-catching image, speak directly to your audience, and have a clear call-to-action (CTA). Let’s say you’re using a PDF as a lead magnet for your audience. Your image could be a bright, brand-colored background with an image of the PDF as a book with an attractive cover, and the with the title and the fact that it’s free stated to the side. 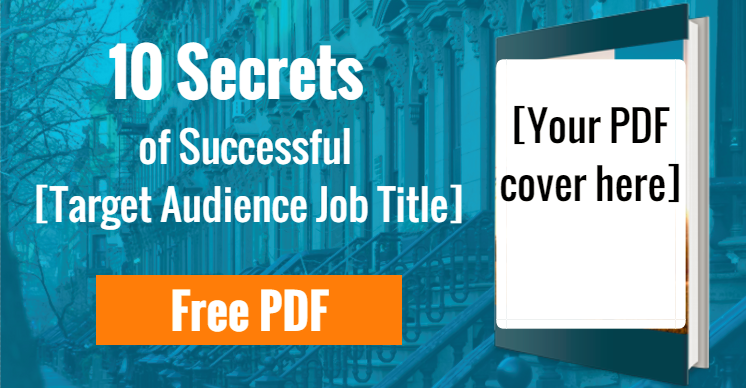 Your headline should directly mention the audience like, “See how [job title] are lowering [specific cost type] by X%…” And the description can explain your company in a sentence and further describe what the user can expect after clicking your ad or what the PDF is about, and remind them to “Download Free PDF” or something similar as the CTA. There are two effective ways to use Sponsored Content ads, and I recommend both. The first is linking to your website or landing page, and the second is attaching them to a lead form. I had a well-designed, focused landing page for one of my LinkedIn clients, and it performed pretty well. But my leads doubled when I duplicated the campaign and directed the same ads to LinkedIn Lead Generation Forms. 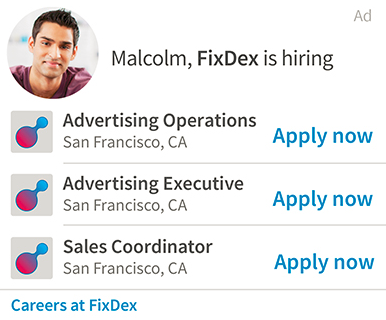 These lead forms open up for the user right in the Linkedin newsfeed after clicking on the ad. It prepopulates with their name, email, job title, etc from their profile, so all they have to do is click submit. There is a place for the more in-depth and informative landing page, but many users are more likely to give you their information if you minimize your interruption and make it easy. With lead forms, you are not taking them away from LinkedIn or even asking them to type in their information, so they can just submit and continue scrolling. The leads gathered by lead forms are stored in LinkedIn, but with a simple Zapier integration, you can seamlessly send them to your email, a spreadsheet, or your CRM. 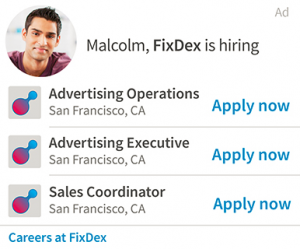 Text ads are the banner ads of LinkedIn. They appear all around the page and can take different shapes. They allow for a small thumbnail image and a short headline. I use these far less than Sponsored Content, but they are almost always part of my mix of ad types because of their value for brand awareness. The image should be something recognizable like your logo, or a short eye-catching phrase like “Free PDF,” and your headline should be just as to the point about who you are or the offer you’re promoting. The average CTR (click-through-rate) on Text Ads is comparatively very low, but if you set the campaign to a CPC (cost-per-click) payment model, you can achieve thousands of impressions essentially at a very low cost, paying for the occasional clicks as they come in. I have not yet tested to see if running Text Ads affects the CTR of my other campaigns, and I’m sure some advertisers actually do see good results from these. Perhaps you will test enough to find the right message and audience to generate a good conversion rate with Text Ads, and I’d love to hear about it! But for me right now, their simplicity, low cost, and high visibility makes them a “why not” in my book. 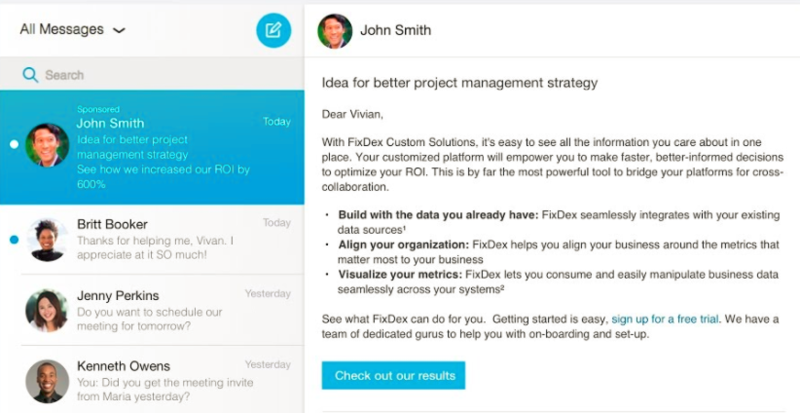 Sponsored InMail ads appear in users’ inboxes as a direct message. The greetings are customized to the user, and like Gmail ads, allow plenty of room for a message, an image, and a CTA button. You can even attach a lead form to these if you’d like. To keep the user from immediately deleting the message, focus on how the user can benefit from the message rather than just pitching your product. Be polite and personable; sound like a human and not an ad. And be short and concise, using bullets, italics, and bold to make your message easily digestible. Keep in mind that these will need to be attached to an actual person’s profile. So the message will appear to the user as coming from [Your Name] rather than [Your Company’s Name]. Just an added incentive to not be annoying. Dynamic ads are personalized banner ads that appear on users’ side bars. They can contain an individual’s name and profile picture, and can drive users to your website or company page. I have commonly seen them used for recruiting, showing the user’s profile picture next to the company’s logo with a message like “Imagine yourself at [Company Name]. Apply Today!”. If you spend at least $15,000 per quarter, you can qualify to have these set up for your account, and you’ll need to reach out to LinkedIn support to get started. So which ads should you use? The answer is to test them all! I recommend Sponsored Content to start, and there’s plenty of testing you could do just with those. But introducing all the various formats into the mix will only help you learn and give you more data with which to make decisions on what works for you and where to focus your budget. Once you launch your campaigns, you’ll start gathering data. This data can be used to inform your decisions as you make changes and continually work to improve results. To make sure you’re getting as much helpful data as possible, you’ll want to set up conversion tracking. This will allow you to see right in the LinkedIn Ads interface which campaigns and ads are generating meaningful actions on your website. And to get an even better understanding of user behavior in Google Analytics, be sure to append UTM parameters to the ends of your ad URLs. With tracking in place and the ability to identify the top performing campaigns and ads, it’s time to test. Without the multitude of options we have in paid search and display, the only three main aspects to test are ads, audiences, and budget settings. I tend to see ad fatigue set in more quickly on LinkedIn than other channels. Users get tired of seeing the same ads and will start ignoring them. You can watch your click metrics to see when this is happening so you know it’s time for a refresh. And as you introduce new ads, remember to always be testing. It is a best practice to run at least two different ads in the same campaign at a time. This way you can compare results and determine which sort of messaging or imagery resonates best with your audience. You can run nearly identical ads with just one difference between them for a precise test on one ad element. Or you can run completely different ads with unique messages, images, and CTAs. I usually prefer the latter because big changes yield big differences in performance and can jump you ahead in the testing process. That said, I tend to use smaller audience sizes, so making big changes is the only way to get meaningful test results without waiting several months. With large audiences comes a larger data set, allowing you to reach statistical significance with smaller changes and grants the luxury of testing one element at a time. The main metric ad tests affect is CTR, with conversion rate as a secondary metric unless you’re testing lead ads where the conversion happens right on the ad itself. To test conversion rate directly for the other ad formats takes a landing page test. To do this, you run identical ads with different destination URLs, and then compare the conversion rates knowing the only difference in the user experience was the page on which they arrived to the site. Audience tests help you hone in on the most responsive portions of your target and are especially useful if you’re casting a wide net to start. The main tactic here is to create identical campaigns with different targets. You can of course do this with any aspect of the audience and multiple at once if you’d like. For example, one campaign could target accountants on the East Coast, and the other could target lawyers in the Southwest. By testing the same messaging on different subsets of your target audience, you will begin to learn which locations, age groups, positions, education levels, companies, etc. are most responsive to your brand. From there you can trim off the less valuable portions of the audience and focus on what works. Alternatively, you may discover that different subsets of the audience are equally responsive, but to different messaging. The accountants might like to be spoken to differently than the lawyers. Or the users in more populated areas may be interested in different products or promotions than those in more rural areas. In this case, you don’t need to cut them out, but make new campaigns catering specifically to their needs. If your audience is too small to do this kind of testing, a test in and of itself can be enabling Audience Expansion. This option allows LinkedIn to go beyond your targets and add users to your audience who it believes are similar to your targets. And the LinkedIn Audience Network can place your ads on LinkedIn partner sites. Remember to mark the dates you enable and disable these so you can compare results with and without the features. The “Bid and Budget” tab has a few options to try, not so much in an A/B test fashion, but to compare against past performance. The first option is bid type. The go-to for most users here is CPC. But there may be some merit to testing CPM (cost-per-thousand-impressions) for a bit. If your CPCs are rising and your impression count isn’t that high, it may be worth testing if CPM actually ends up saving you money on ad spend. Next is your daily budget. This is something you change as the result of other tests, putting more spend into the campaigns that are generating the best results. Adjusting bid however, is a testable option. The higher your bid the more competitive you are in the auction against those targeting a similar audience to you, but it will also cost you more for each click. Change this periodically to find your most efficient sweet spot of total clicks and CPC. The final option to test is ad rotation, with the choices of optimize for clicks or even rotation. Even rotation will enter each ad into the auction an equal number of times. This does not guarantee equal impressions, but can help leave out LinkedIn’s automatic optimizations as an unknown variable in your tests. The optimize option uses LinkedIn’s machine learning to more frequently enter the ads with better performance into auctions. We’ve seen Google begin to favor advertisers who use their version of the optimize option, generating good initial results as we’ve switched over. We have not seen any data yet suggesting a similar move from LinkedIn, but I have become less wary of the option in general after the Google switch. Worth a test to be sure! If you’ve made it this far I’m sure the brainstorm brewing in your head is ready to be unleashed. So remember to target the right audience, speak to them with different types of targeted ad copy, and test everything. So go forth! Thousands of potential customers are waiting for you on LinkedIn. Hi there, and thank you! So glad you're enjoying the blog and finding it helpful. Good blogs can come from writing about the things you're already doing and have a passion for. Something you may do all the time could be a completely new idea for someone else. So you can create a useful blog by doing some research to add to your existing knowledge, and putting yourself in the readers' shoes to help you organize and lay out your thoughts in a logical way. Happy blogging! I think LinkedIn is super important for any business. This article helps explain it through. Hi there, and thank you! So glad you’re enjoying the blog and finding it helpful. Good blogs can come from writing about the things you’re already doing and have a passion for. Something you may do all the time could be a completely new idea for someone else. So you can create a useful blog by doing some research to add to your existing knowledge, and putting yourself in the readers’ shoes to help you organize and lay out your thoughts in a logical way. Happy blogging!